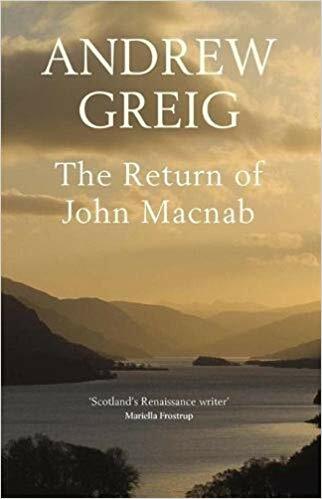 Andrew Greig seems to like to base his novels on Scottish texts, legends, or history, and The Return of John McNab is no exception. This novel is a reworking of a classic novel by John Buchan, John McNab. I am not familiar with this novel, but I got the idea right away. In the original, three men announce they are going to go poaching, that is, catch a salmon, shoot a grouse, and shoot a stag on three different estates and deliver the game to the grounds of the estate. (I know this isn’t the proper Brit terminology. I’m using “estate” in its American meaning of a large property owned by a wealthy person.) This wager is meant as a protest against the ownership and use of large portions of land in the Highlands for only a few wealthy people. These men call themselves John McNab. Neil Lindores proposes to do the same thing, aided by his friends Murray Hamilton and Alasdair Sutherland. He does not count, however, on attracting the attention of Kirsty Fowler, a local journalist. With plenty of close calls, the adventure begins, but the men’s final target is Balmoral. The Prince of Wales is in residence, and the security people are apt to believe that the well-publicized challenge is a threat hidden within a stunt. This novel is an earlier book by Greig. It is entertaining enough, but it does not feature the brilliance of some of his later works. It’s strictly an adventure/romance novel.